The NS-DOC is dedicated to memorializing the victims of the Nazi regime, as well as research and teaching about Cologne's history during the Nazi era. 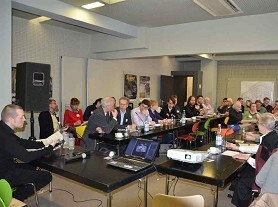 The museum’s educational department and the Infor­mation and Education Association against Right-wing Extremism (ibs) also run educational and teaching programs. The NS-DOC views itself as an important research locus. This is supported by the library and the task of the documentation department, with its extensive collections of photo­graphs, posters, artifacts, documents and witness statements, which are organized into databases and made accessible. The NS DOC’s education department develops tours of the museum and the memo-rial. 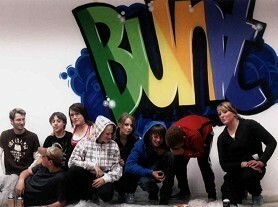 In addition, the center runs a workshop on “Youth Culture in the Nazi Era”, a tour called “Navajos and Edelweiss Pirates” through Cologne’s Ehrenfeld district, where an anti-Nazi resistance group operated during the war, a “Childmobile – Suitcase Full of History” that works in schools and day-care centers and the family tour entitled “What Happened in the EL-DE Building?” In addition, the department develops spe-cialized programs for target groups such as specific professions, university students, student teachers and teachers. Since the beginning of 2008, the Info- and Education Office against Right-wing Extremism (ibs) has complemented and broadened the work of the NS Documentation Center. The ibs addresses the issue of extreme right-wing ideology in the world today. Its goal is to foster a consciousness of human rights, democracy, cultural diversity and non-violence, as well as to confront and prevent extreme-right patterns of thought and action. Info- and Education Office fund a mobile counseling project against right-wing extremism in Cologne county. The library is primarily a reference library, with a focus on literature about Cologne during the Nazi era, the general history of the Nazi regime, as well as its didactics, and about right-wing extremism. In addition to current books and newspapers, the library collects dissertations, contemporary magazines, books, brochures and printed materials published by Nazi organizations, such as public notifications. Also in the collection are in-house organs from companies in the Cologne area. The library holdings comprise approximately 17,300 volumes (as of 2011). Use of the library is free. The catalogue can be viewed online on three Internet pages. 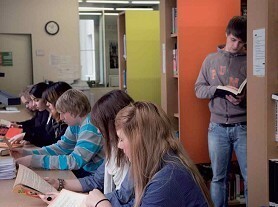 Library users receive help and advice on their projects, and a media center can be used for viewing materials. 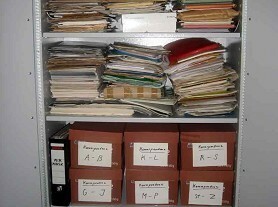 The documentation section provides a critical foundation for historical research, as well as for processing the results. This is where various historical source materials are secured, managed and made accessible, and where the information databases are created and maintained. The collection is made up primarily of photographs, photo albums and collections, posters, museum objects, personal documents, diaries, letters and witness statements. Gifts, permanent loans and the reproduction of photographs ensure that the holdings are constantly growing. The “Jewish Life in Cologne” collection alone comprises materials from 300 smaller and 30 larger personal estates, including some 4,000 photographs and numerous original documents. The photo archive has catalogued 30,000 photographs so far, with many more still to be processed. The NS Documentation Center has, since the beginning, also viewed itself as an im-portant research locus, as the name suggests. Much of the documentation from Co-logne's Nazi era was destroyed or lost during the war. So the first task is and was examining, collecting and securing materials (files, documentation, artifacts and pho-tographs, as well as books and brochures), then cataloguing them in databases and analyzing them. The results of this research work are reflected in all areas of the in-stitution’s activities – in publications, special exhibitions, events, the Internet pres-ence and the educational programs. 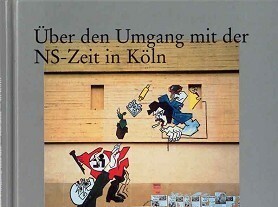 Since 1994, Cologne publisher Emons has brought out series of “writings of the NS Documentation Center of Cologne.” In 2012, a sub-series called “biographies and materials" was added. In addition, since 2005, the NS DOC has itself published a series of teaching workbooks and, since 2008, a series by the ibs. There have also been numerous individual publications related to the work of the documentation cen-ter. Since 2003, the center’s activities have been documented in detailed annual re-ports.